Semifinal, Sweden 1958: France had an extraordinary side with Raymond Koppa and Just Fontaine. The latter is still the player to have scored most goals in one World Cup, with 13 in this one year. In the semifinal however, they were up against one of the most legendary Brazilian sides of all time. Brazil won 5-2, and later became World Champion against Sweden. One young 17-year old Brazilian scored three goals to defeat the French: Pele. Quarterfinal, Mexico 1986: Brazil and France were filled with some of the World's most talented players, and in this quarterfinal played one of the most entertaining matches ever seen in a World Cup. It ended 1-1 in ordinary time, althoguh 5-5 would probably have been a more fair score. Legendary Brazilian Zico missed a penalty 10 minutes before the end of the match, and after extra time, France won on penalty kicks. Final, France 1998: France had never been World Champions until they hosted it this year. In the final they were to face the defending champions of 1994, Brazil, who had had a quite mediocre performance, but nevertheless made it to the final. However, the Brazilians were no match for the motivated Frenchmen, who crushed Brazil 3-0 in one of the most uninteresting finals of all time. I am certain that the quarterfinal match on Saturday will be another for the history books. France is motivated after their win against Spain, while Brazil has been looking vulnerable until now. The game could go to either side. What distinguishes great teams through history, is that they win the right matches at the right time. Spain has never been a big team. But France has, and showed it again last night. Walking into the match, Spain had three first round victories, while France had been mediocre to say the least, barely qualifying for the last-16 by defeating Togo. So all eyes were set on Spain, and the fact that this might be their year. It wasn't, even though David Villa brought the Spaniards ahead on a penalty kick. 3-1 for France was the end score, where Ribery, Vieira and Zidane took advantage of Spanish mistakes. It is amazing to see Spain, again and again losing in important tournaments, by being naive and unconcentrated. In any case, Brazil-France in the quarterfinal is another clash of titans, much more than a Brazil-Spain. So that is something to look forward to indeed! Brazil's second goal was indeed off side. But in spite minor free-kick blunders, referee Lubos Michel is no explanation for Ghana's exit. Brazil was the better team, using two of their main assets, experience and pace, to defeat a charming but somewhat naive Ghana side. The Ghanaians blundered after 5 minutes, giving Ronaldo the chance to become the leading World Cup scorer of all time. This killed off the match. The Brazilians could after that moment stand back, let the Ghanaians play the ball around, get a few chances which they blew, and otherwise strike on their deadly counter-attacks. Brazil was never in danger of losing the match; they didn't even out-stretch themselves. Ghana should still be proud. It is not often a World Cup debutant progresses to the second round, and a game against Brazil is always bound to end this way. Now Ghana has World Cup experience, and will hopefully make it to South Africa in 2010! Can't wait to see them there! On the other hand, the Brazilians are bound to underestimate Ghana (although Coach Parreira has once been Ghana national coach, in the 1960's...) and a quick Ghanaian goal might start off an exciting match, just like the good fight Denmark gave Brazil in the 1998 quarterfinal. Although a Ghanaian victory would be great, I just can't see it happening. Accra will surely go crazy if it happens! But I just hope Ghana will give the Brazilians a great fight! Italy-Australia and Switzerland-Ukraine get the price for the most amazingly boring matches in this World Cup, and certainly score high on the list of all-time most boring matches. What a waste of time! Italy played boring as usual, and even one man up, the Australians were as much a threat as a lazy koala. In the end, the Italians had their usual luck, scoring on a non-existant penalty, properly taken care of by "Snotti". Switzerland has become the first team ever to be eliminated from the World Cup, without conceding a single goal. Don't know how much I'd be proud of that one after last night. I counted two chances in the whole match, including extra time! And the Ukranians were no better, pointelssly playing the ball around. I have no idea how deserved it was for the Ukranians to win, but the fact is, that the Swiss certainly do not aim like Wilhelm Tell. Friendly taunting is part of the World Cup. I certainly don't hold back with taunting the English for their "pretty boy" team or the French for their old men. A German getting back at the Dutch team on its way back to the Netherlands. A good friendly laugh indeed! The first matches of the last-16 were played this weekend. Germany was excellent against a tame Swedish side, although they only won 2-0. Sweden has really been one of the most over-estimated side of the torunament, and will hardly be missed. Argentina-Mexico was as expected, a difficult match for the Argentinians. The Mexicans, who have not been very impressive, put up a good match against Argentina, who was somewhat disappointing. However, Maxi Rodriguez gave Argentina the victory with a stunning strike! One of the best goals of the tournament. England was again not impressive against little Ecuador, although winning a narrow 1-0. Two things saved England: Ashley Cole's tackle in the first half, and David Beckham's great free-kick. As before, England needs to play much better if they are to hope to defeat any of the big teams. Portugal-Netherlands was a true knock-out drama, ending in disgrace for both teams. Netherlands confirmed that in spite of many great players, they have not managed to pull a team together at all - making you wonder about Dutch football. The Portuguese won, but it was a hard won victory, ending in disgrace: two red cards for each game, and Portugal will be missing Deco, Costinha and Cristiano Ronaldo against England. In spite of this, England-Portugal promises to be another drama, a repeat of their quarterfinal clash in the 2004 European Championship, where Portugal won a dramatic victory after penalty kicks. The best thing for now about this World Cup, is that we are getting these huge classic encounters in the quarterfinals. Already a Spain-France tomorrow, and possibly a Brazil-Spain in the quarterfinals! This is football for giants! Ronaldo has been highly criticized lately, and he is certainly not such a potent striker as he used to be. In spite of this, he can still score goals. In last night's Brazilan win against a rather tame Japanese side, Ronaldo scored two goals. With that, he has now scored 14 goals in World Cups (1998 and 2002 included), equalizing legendary Gerd Muller's 14 goal all-time record. With only one more goal, Ronaldo will place himself firmly on top of the all-time scorers list. It was boiling, and now it has exploded!!! Ghana is in the last-16. In spite of a mediocre game, Ghana won 2-1, on a non-existing penalty given by a very friendly referee (one thing you can say about the US is that the referee's have not been overly nice to them). But what the hell? A victory that counts as good as any other. Unfortunately, the Italians won 2-0 against the very disappointing Czechs. Italy thus wins the group, and will have an easier time in the last-16, where they will face Croatia or Australia. Ghana on the other hand, will likely face Brazil. The defending World Champions against my favourite African debutants. It will be hard, and the more so, as Ghana's super midfielder, Michael Essien, will be out with a suspension. Ghana will have to correct many mistakes: any defense error will be swiftly punished by the Brazilian super strikers. Any chance Ghana will get must be scored on, as the mighty Brazilian defenders will not be in the mood for gifts. Brazil. Who would have thought? 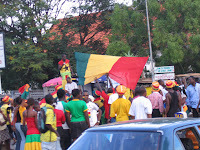 And as I write this, a huge party is going on outside in the streets of Accra! Cheers Ghana! Ghana is usually hot! Very hot. But today, the country is boiling!!! Not because of the weather (actually, it is an average hot day). But because of football. After Ghana's first ever World Cup victory against the Czech's, Ghana stands a good chance of progressing by beating the USA! I shall leave my office soon, to go to Osu (Accra) and watch it in a local spot. It will be crazy. It will be emotional. And if Ghana wins, it wil be a big party! We are all boiling here! Argentina is very strong. In spite of a boring 0-0 against the Netherlands, Argentina was in control to win the group. Next round Mexico awaits. That should be a match to watch for however. The Mexicans have not been playing well, but they often get extra energy from somewhere when playing Argentina. So the match should be a thrill. I have no doubt that the Argentinian stars will shine however, and I hope to see Argentina get very far! Ghana was stunning against the disappointing Czechs. They were disciplined, combined beautifully, defended well, and created plenty of chances. But actually Ghana failed in one thing: they should have scored many more. In a World Cup, you cannot expect to have that many chances. That is what differentiates the big teams from the small teams: big teams just need one chance to score. We have already seen it this world cup with Italy and the Netherlands. Living in Ghana, I can only be caught up in the boiling excitement the country is currently going through. People are eagerly awaiting: "who will we play in the next round?". While this is wonderful, it is no easy obstacle ahead: the USA, who also have a chance of entering the last-16 by defeating Ghana. And Ghana will be missing two crucial players: Muntari and Asamoah Gyan are both suspended. These are Ghana's only two scorers so far! With the incredible inefficiency of Ghana's attack, this is a major loss. I hope Ghana wins. 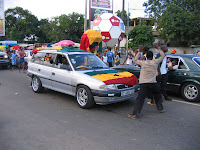 I hope to be celebrating in the streets of Accra (although I will probably not be able to leave the office...). Being objective however, I think the game will be extremely difficult for Ghana - much more than Ghanaians themselves believe! But until then, Ghana is living the magic of World Cup success! Lately, I have not been on the internet much. But of course, I have keenly followed the 2006 World Cup! Last night, England won their group in front of Sweden by tying 2-2, and will be facing the surprising Ecuadorians in the final. In spite of the results, England cannot be happy with the way they have been playing; two unimpressive victories against mediocre teams, and a tie against Sweden, which was based mostly on individual skills (Joe Cole's marvellous strike) and awful English defending. Most English already believe they are world champions, and that Ecuador is nothing but a walkover. No doubt, England are huge favourites against the Ecuadorians (who, in spite of the excellent results, are nothing but a mediocre South American team). But they will certainly have to play better, also if they want to have any chance against bigger teams. Only in four more years! "1. From 9th June to 9th July 2006, you should read the sports section of the newspaper so that you are aware of what is going on regarding the World Cup, and that way you will be able to join in the conversations. If you fail to do this, then you will be looked at in a bad way, or you will be totally ignored. DO NOT complain about not receiving any attention. 4. During the games I will be blind, deaf and mute, unless I require a refill of my drink or something to eat. You are out of your mind if you expect me to listen to you, open the door, answer the telephone, or pick up the baby that just fell from the second floor... it wont happen. 6. Please, please, please!! if you see me upset because one of my teams is losing, DO NOT say “get over it, its only a game”, or “don’t worry, they’ll win next time”. If you say these things, you will only make me angrier and I will love you less. 7. Remember, you will never ever know more about football than me and your so called “words of encouragement” will only lead to a break up or divorce. 8. You are welcome to sit with me to watch one game and you can talk to me during halftime but only when the commercials are on, and only if the halftime score is pleasing me. In addition, please note I am saying “one” game, hence do not use the World Cup as a nice cheesy excuse to “spend time together”. 9. The replays of the goals are very important. I don’t care if I have seen them or I haven’t seen them, I want to see them again. Many times. c. I will not go. 11. But, if a friend of mine invites us to his house on a Sunday to watch a game, we will be there in a flash. 12. The daily World Cup highlights show on TV every night is just as important as the games themselves. Do not even think about saying “but you have already seen this...why don’t you change the channel to something we can all watch? ?”, the reply will be: “Refer to Rule #2 of this list”. 13. And finally, please save your expressions such as “Thank God the World Cup is only every 4 years”. I am immune to these words, because after this comes the Champions League, Premier League, Italian League, Spanish League, etc etc. 14. Thank you for your co-operation. With the World Cup coming up, the World Cup historical geeks start discussing before games. An interesting one I heard recently was the a discussion on the top 5 best teams that had not won a World Cup. I have spent some time thinking about this list. I find it a big difficult, because should it entail teams that almost won it? Teams that played very well but did not make it far, or teams that should have won it, but lost after huge upset? 5. Brazil 1950: Brazil should have won its first World Cup ever in 1950, at home in Maracana, in front of a record crowd of 200,000 spectators. Instead, facing all the adversity in the world, little Uruguay put a stop to the celebrations in all Brazil, to give the Brazilians their most painful defeat ever, by winning 2-1. Brazil has still never won the World Championship on own soil. 4. Czechoslovakia 1934: The Czechoslovaks had one of the best teams of the world in the mid 1930's, although playing a World Cup final in Rome during Mussolini was never going to be an easy task. Il Duce made sure that Italy would have all advantages, even a very friendly referee. In spite of this, the Italians only managed a narrow 2-1 victory after extra time. 3. Brazil 1982: 1982 and 1986 probably were the two World Cups with most of the legendary players assembled at one time. The teams were amazing, and it is difficult to choose one that could not have been a worthy champion (France, Germany, Poland...). However, I have chosen Brazil, because it was undoubtfully one of the most talented generations of Brazilian football: Zico, Socrates, Falcao, Junior, Cerezo, etc. In spite of their magic, they never lifted the trophy. 2. Netherlands 1974: This team, led by the legendary Johann Cruyff, took the world with storm with its relaxed attitude and marvelous "Total Football". They were a beauty to watch, and were far superior to every team in 1974 in Germany. Until the final, they had cruised through, even trashing the mighty Brazilians. In the final in Munich, they started with a pentalty goal in the first minute against the West German hosts. However, the Germans managed to fight back to win 2-1 in one of the most legendary finals of all time. This was my list. Any opinions?